Soon after Occupy Chicago was organized three years ago, at least 2,000 of its members amassed in Grant Park during a noisy protest. More than a hundred were arrested. But the scene was far different earlier this week when the group marked its anniversary. 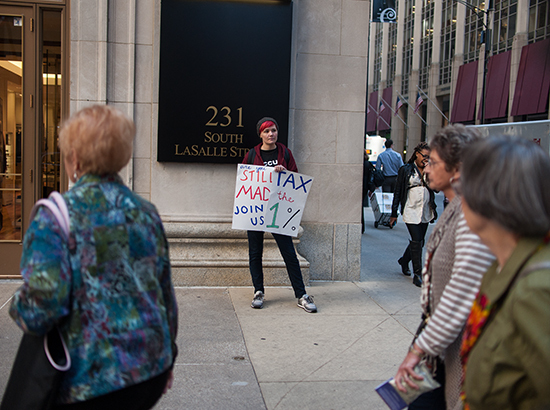 Standing outside the bustling Chicago Board of Trade, a symbol of American capitalism, a handful of Occupy Chicago members quietly chatted and held signs. It looked like a reunion of old friends. For them, the anniversary was not about numbers. The Occupy movement had opened their minds to the possibilities of social change, they said. Jaime Dominguez, a lecturer in political science at Northwestern University, said Occupy Chicago highlighted important issues such as income inequality and environmental justice that had been put on the back burner, even though the ranks of the movement have dwindled locally and nationally. 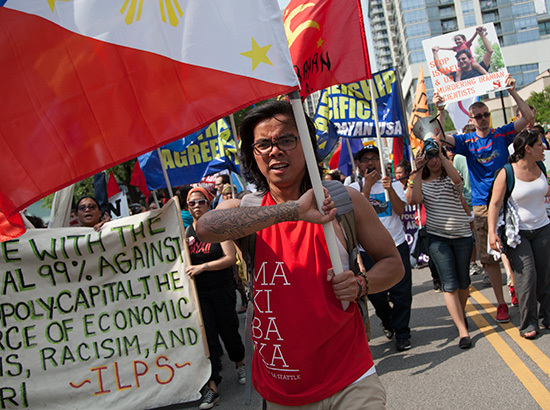 “Occupy created a public space at which to organize and bring attention to these issues,” he said, adding that efforts to address student debt and immigration reform gained momentum from the national Occupy movement. Deana Rohlinger, an associate professor of sociology at Florida State University, said the movement had an influence on other groups, who have since borrowed its tactics. She pointed to the Flood Wall Street protest in New York, the day before the Chicago anniversary, as an example. The Occupy movement gave many people the experience and connections they needed to start being active in their communities, she said. Each of the protesters who marked the anniversary at the corner of Jackson and LaSalle said Occupy Chicago sparked a lifetime passion for activism. Babur Balos has been volunteering with Chicago Light Brigade, formerly known as Occupy Rogers Park. Jesus Chuy Campuzano has worked with disabled community through Access Living. Perrotta coordinates pro bono media releases for grassroots organizations. And Megan Groves has participated in various protests, including one she organized. All had been part of Occupy Chicago since the beginning. As Chicagoans enter an era with Trump as president and Emanuel as mayor, the factory workers’ occupation offers a model for resistance. Testimony in the NATO 3 trial showed that Chicago police spied on lawful dissenters during the buildup to the NATO summit in May 2012.